Edith Mary Evans was born in Pimlico, London on 8th February 1888, the second child of Edward ‘Ned’ and Caroline Ellen Evans. Sadly her older brother, Edward, died when she was just two years old leaving her the only child of the family. Edith was educated at St Michael’s Church of England school in Pimlico. She left there when she was fifteen and was apprenticed to a local court milliner, Mr Blackaller, in Buckingham Palace Road. Edith was appointed Dame Commander of the Order of the British Empire (DBE) in the New Year’s Honours List for 1946 for services rendered to E.N.S.A. during the war. She also received honorary degrees from the universities of London (1950), Cambridge (1951), Oxford (1954) and Hull (1968). Edith first met her future husband, George ‘Guy’ Booth, in 1905 but they didn’t marry until 9th September 1925. Ten years later Guy died of a brain tumour. Edith’s interest in acting started when she attended drama classes run by Miss Massey in Victoria. Miss Massey encouraged her students to perform Shakespeare’s plays for their own amusement and once a year the group staged a programme of Shakespeare plays at Streatham Town Hall. Edith’s first stage appearance was in 1910 when she played the part of Viola in ‘Twelfth Night’. In 1912 she played the part of Beatrice in ‘Much Ado about Nothing’. Watching her on stage was the producer, William Poel, for whom she played her first professional role in August of that year. Dame Edith is perhaps best known to many for her portrayal of Lady Bracknell in Oscar Wilde’s comedy ‘The Importance of Being Earnest’. She first played the part on stage in 1939 and famously on film in 1951. She came to loathe the role and once said “I played her everywhere except on ice and under water”. In 1955 scenes from ‘The Importance of Being Earnest’ were televised on the opening night of commercial television. 1955 was also a significant year for Dame Edith as it was the year she came to live at Gatehouse, Kilndown. Harold and Vita Sackville-West were responsible for making Edith aware of Gatehouse when they sent her the sale particulars. 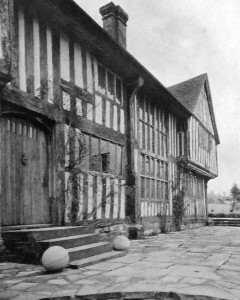 Edith had sold Washenden Manor, her home in Biddenden, but retained her Albany apartment in London. She had decided that she no longer needed a home in the country but when she was persuaded to view Gatehouse she fell in love with it. However, she was daunted by the asking price of £8,000 as she thought it was beyond her means. The situation was resolved when her close friend, Judith Wilson, purchased the property and the two women agreed to live there together and share the running costs. Edith and Judith created a comfortable home employing a local couple, Mr & Mrs William Houghton as Edith’s chauffeur and to help with household chores. In 1960 Judith died. In her will she left Gatehouse in trust for Edith for the rest of her life, allowing her to continue living there. Edith kept her faithful employees Mr & Mrs William Houghton and locals recalled her being driven slowly through the village in her Rolls Royce so that she could give them her ‘regal wave’ as she passed! Edith was no gardener but she did enjoy a stroll, and sometimes indulged in pottering, in the garden at Gatehouse. When her health was failing and walking around the garden became a problem, particularly as much of it was on a slope, she would sit in the garden room on sunny days and look out over the garden. Climbing stairs was so difficult that a lift was installed in the house to carry her to her bedroom. Although Judith had brought her considerable library to Gatehouse, Edith did not care too much for reading. However, she did enjoy biographies and poetry and had several inscribed volumes from her good friend, the poet Richard Church who lived at Curtisden Green. In 1971 Edith suffered a massive heart attack. In accordance with her Christian Science beliefs she refused all orthodox medical treatment. Against the odds, over several months she made a remarkable recovery. However, it was felt that having nothing to occupy her was impeding her recovery. Therefore, in 1972, Bryan Forbes persuaded her to allow him to make a film of her reading poetry. He also managed to catch some reminiscences of her life in acting along the way. The finished programme was shown on television in March 1973 under the title ‘Dame Edith Evans – “I caught acting like the measles”.’. In April 1976 Edith suffered a stroke that affected her speech. The truth about her condition was kept from her blaming the problem on food poisoning instead. Deafness was also becoming an increasing problem. She was due to make three professional appearances during the year: one on television with Edward Heath; a small film role with Glenda Jackson; and a sound broadcast on August 15th for the BBC in front of an invited audience. 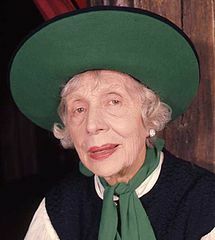 The last words Dame Edith Evans spoke in public before her death was her reading of a poem written by Richard Church. The poem was about Death. In later years Edith also came to rely on her devoted companion, Mrs Avis Merton. Avis was at Edith’s bedside when she died at Gatehouse at 12.20pm on 14 October 1976. Her funeral service was held at Christ Church, Kilndown on 20 October and the mourners were mainly local villagers and her late husband’s relatives. On the day of the funeral the electricity supply failed and so there was no heating or organ music in the church. The service was followed by a cremation at Tunbridge Wells. In accordance with her wishes, Dame Edith’s ashes were placed in an urn and deposited at St Paul’s church, Covent Garden. A Thanksgiving Service to her memory was held at St Paul’s church on 9 December 1976. The service was simple but attended by many from the theatre world. The address was given by her official biographer Bryan Forbes. Throughout her life Edith feared she did not have much money. She did not live an extravagant life. However, in her will had left an estate worth £126,000, far more than she could ever have appreciated. She had made several bequests to family and friends but the bulk of her estate was to be divided four ways between: The First Church of Christ Scientist in Sloane Square, The National Trust, King George’s Pension Fund for Actors and, finally, the greater part to the Actors’ Charitable Trust. Gatehouse reverted to the estate of the late Judith Wilson.